Have a question on X4? X4 is available in 3 different colors - Alpine White, Melbourne Red and Gray. Watch latest video reviews of BMW X4 to know about its interiors, exteriors, performance, mileage and more. Find the BMW X6 quite bigger, intimidating, and pricey? BMW surely has made the coupe-SUV design even more accessible with the X4. For those who don’t know, the X4 is a scaled-down version of the X6 with more accessible price range and performance. The car showcases smaller dimensions as well as sleeker looks. The X4 is positioned between the more conventional SUVs, X3 and X5, as a lifestyle vehicle. Given that this X4 is one of the most recently updated cars in the lineup, it gets all the latest technologies and design elements. All to make it sure that it breaks the monotony commonly associated with BMW offerings. Like the front fascia, the interior cabin of the X4 too is shared with the X3. The fully TFT instrument console gets an all-new design which is quite cool to look at. And so is the steering wheel, which is something very different from what we have seen in other BMW cars. The hexagonal styled centre console is slightly tilted towards the driver side and gets AC vents in one half and buttons for climate control and infotainment screen on the other. The full touch sensitive and gesture and voice-controlled infotainment screen is freely mounted on the upper half of the dashboard. The silver, as well as piano black inserts at places, lift up the ambience of the cabin of the X4. Like the X6, rear seat feels premium, due to the sloping roofline. Just like its elder sibling, the X6, the BMW X4 is a love child of an SUV and coupe, which is explained by its flamboyant body style. The X4 gets a raised stance of an SUV and a sloping roofline of a coupe, making it look quite distinctive. The X4 front stance might remind you a lot of the X3, with both the SUVs sharing much of the front fascia. The double kidney grille with the full LED headlamps spaced a bit from the former is entirely lifted off from the X3’s front fascia. And so is the front bumper design – the LED fog lamps get aggressively styled creases around them to make it look sporty. The side profile of the X4, like the X6, has a dramatic essence to it, courtesy the sloping roofline post the B-pillar. Compared to the X6, the X4’s roofline is more slanted, which makes it look even sleeker, a feeling which is only accentuated by lesser length and height as compared to the X6. At the rear, the BMW X6 has a slanting windscreen and a roof mounted spoiler, which makes the rear look extremely athletic. The LED tail lamps here are very sleek and look like as if they are picked up from a sports coupe. As said before, the BMW X4 shares its basic chassis as well as suspension setup with the X3, which is already a capable SUV on its own. However, given the alterations paid to the ride height and dimensions, the X4 is more aerodynamic in comparison to the X3 on which it is based. These alterations, in addition to the very capable drive modes and variable suspension settings, make the X4 an even more agile SUV to drive. Given that it shares the basic architecture with the X3, it is quite obvious that the X4 mirrors former powertrain as well. Under the bonnet, the engine on duty is the same twin-turbo 3.0-litre V6 petrol engine shared with the 5 Series as well as the X3. Here too, the engine pumps out 360 PS of power and 500 Nm of torque and is mated to an eight-speed automatic gearbox. 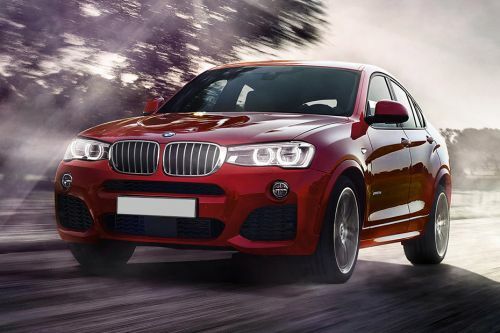 BMW has tried to equip the X4 with all the essential safety features. And just like the comfort and convenience features, even the safety kit has been shared with the similarly priced BMWs like the 5 Series and the X3. The X4 comes fitted with front, side, curtain and knee airbags, ABS with EBD and Brake Assist, Lane Departure Warning, Forward Collision Warning, cornering brake control, dynamic traction control, and hill start assist. With a more affordable price range and friendlier dimensions, and engine performance, the BMW X4 manages to retain the uniqueness of the X6, but in a much more accessible way. Like all the BMWs, the X4 too has a sporty character in its performance and driving dynamics, and it certainly looks and feels the part as well, thanks to its extrovert design and modern interiors. What is the price of BMW X4? On road prices of BMW X4 in starts from AED315,000 for base variant xDrive28i, while the top spec variant xDrive35i costs at AED349,000 . What are the colors options available in BMW X4?